I don't normally review titles not available through my primary vendor, Baker and Taylor, but I made an exception for this one since it's on a topic I'm specifically looking for more materials on. The book begins with a note to parents, explaining how storytelling can be a good therapy tool and how to use it when talking with children about divorce. The main story is about a cute and cuddly bunny called Zoey. She's super excited about her school's magical activities, but all through the day, from searching for chocolate carrots to visiting with the wise fairy owl, she keeps remembering things that worry her. Things like scary words she doesn't know, like SEPARATE and DIVORCED. But at every moment, her mother, father, or the wise fairy owl are there to explain things to her. It's not her fault, her parents both still love her very much, her parents will still take care of her in both homes. Change is hard, but with her parents' help Zoey will be ok. The book ends with a list of further discussion questions for parents to talk about with their children. I was very attracted to this by the illustrations; this is where a lot of small presses seem to fall down, but the illustrations are sweet and professional, showing a fluffy bunny, warm and caring bunny parents, sparkling feathers, and other bunnies enjoying activities like sliding down rainbows and chasing sparkles. Which is something that didn't really click for me - this story is rather, well, blandly magical if that's a word. I can see kids getting really distracted by all the sparkles and rainbows and losing track of the story. It's also very text-heavy, which isn't unusual for titles in my parenting collection, but I can't see reading this to a wiggly preschooler. A sample sentence, "Zoey laughed and laughed as she held on tightly to the beautiful deep-blue feather covered in sparkles and pretty gems." 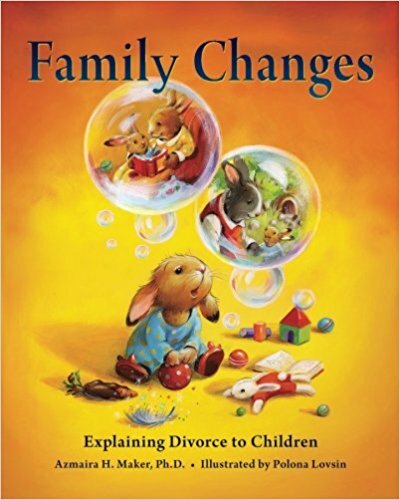 I'm still hunting for a more realistic divorce book; many, if not most, of the families I am searching for resources for do not have this type of amicable, reassuring divorce; one or both parents are often absent and there is a lot of family strife and chaos. Often the father is suddenly gone and only peripherally, if at all, involved with the children. Verdict: For what it's meant to do, i.e. be used as a therapy tool by parents and therapists working with very young children, this is quite good. The illustrations are strong and the story, if read in small chunks, would probably start some good conversations. It's not quite what I'm looking for, but would make a good addition to your parenting collection if you're trying to add more divorce materials. It is available from the publisher or Amazon (I can't speak to Ingram, but they often have more small press or self-published materials available so it might be on there). My staff set up Craft-o-rama on Tuesday and Free Lego Build on Wednesday. We were closed on Friday. I told them not to contact me unless the rogue satellite falls on the library. I admit that I don't really see the appeal of pugs; I'm not a fan of small dogs (except corgis, and I consider those big dogs with short legs) but if anyone was going to make me like pugs it would be Flora Ahn. Sunny has an ordered, regular life. But something feels... wrong. She does her yoga, checks the neighborhood (why won't the neighbor dogs talk to her? ), and arranges her toys. Then she finds out what's wrong... she's getting a new sister! Rosy is small, and cute, and enthusiastic. Sunny hates her! Rosy takes her toys, chews on her legs, and just drives her crazy. Worst of all, she loses Bunny, Sunny's favorite toy! Sunny can't take it anymore and says some mean things before storming away. But when she comes back, Rosy is gone! Sunny will have to suit up for adventure and rescue her new sister. Along the way, she'll discover that maybe Rosy isn't so bad - and she's got a new friend as well as a new sibling. Ahn's charming, minimalist black and white illustrations really make this. Her dog legs (Sunny's "drumsticks") are hilariously cute and she perfectly captures the sulky older dog who is miserable at having her life interrupted and the exuberant little pup who just wants to play, play, play. Plump Sunny dressed for outdoor adventure with jacket and backpack is a charming sight and the simple line drawings will inspire children to try drawing their own pugs. 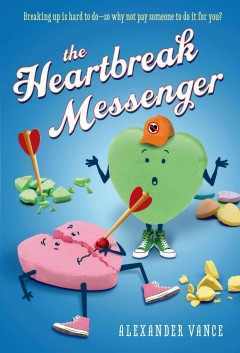 Verdict: If you are looking for more illustrated beginning chapter books, this sweet tale of sibling rivalry and reconciliation is sure to hit the sweet spot for readers and listeners alike. 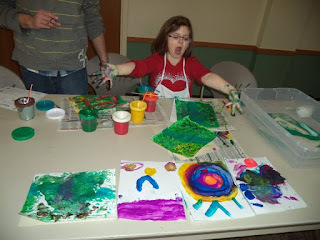 The story begins with Ellie Bell in her workshop, getting ready to engineer a creation that will pay back the neighborhood boys for keeping her and her best friend Kit out of their soccer game. Ellie's creation works and the boys are soon soaking wet! But she's always planning the next project - and that next project is going to be an amazing doghouse for Kit, after she and Kit overhear Kit's mom saying (they think) that she's finally getting her longed-for dog. If only Ellie Bell could engineer her relationships as easily as she engineers things with wood and screws! She soon discovers that she needs more help with her doghouse, but she can't ask Kit, her usual companion in engineering. She finds herself teamed up with Toby, the ringleader of the boys, and the crafty girls' group. But none of these groups get along and Kit is starting to wonder what Ellie's up to. 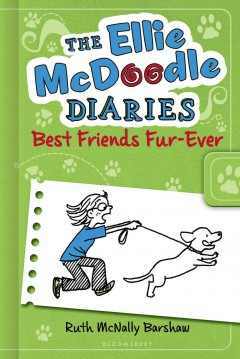 Can she make an awesome doghouse, some new friends, and figure out how to keep everyone happy? Most of Tuesday Mourning's illustrations are sketches from Ellie's notebook, mechanical drawings, and illustrations of her interesting creations. 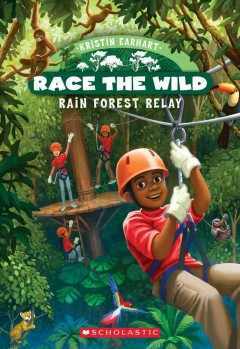 Ellie is shown as white on the cover and the race of the other characters is not shown. At the back of the book are brief descriptions of the different tools Ellie uses and how readers can use their own tools. Ellie's story is a little didactic; it's hammered (heh) home rather heavily that she likes both building things and cute dresses; her best friend Kit enjoys being in pageants and playing with fashion, but also likes building things with Ellie. For this age group, though, they need things spelled out explicitly. There's a lot of different interests shown and Ellie appears as the glue that sticks together all the different groups; the boys who like to build things and play soccer, but also feel bad that they aren't invited to the fancy tea party, the girls who like to decorate things and are crafty, but think that building things might be fun too. Ellie reflects on how mad she was when the boys wouldn't let her play soccer because she's a girl and realizes that they feel left out too when they aren't invited to the tea party. This is an over-simplification of a complicated issue, but it's presented in a way that makes sense to kids. Verdict: A fun STEM-themed book that reminds girls they can like what they like - be it engineering, crafts, fashion, or all three. While it has a rather pat ending, kids will delight in the coming together of all the loose threads, the creation of new friendships, and the surprise happy ending. I saw this recommended somewhere, but I didn't think the cover looked very attractive. However, I requested it to take a look anyways and I'm glad I did. The cover is, admittedly, not inspiring. This picture is rather faded - the colors are a lot brighter. However, the art is bland and digital, the animals all have big round eyes, and the whole thing looks like a collage of clip art. But the real draw of this book is the very sturdy interactive elements. Little readers can "shear" the sheep by moving off her wool (leaving the sheep in a yello-spotted bathing suit), milk "Reba the cow" by swinging a cardboard piece up and down, drawing milk from her teats, and feed the Zora the horse a never-ending stream of carrots and sugar cubes on a spinning dial (no, er, waste is included in this cycle, although that would have been more realistic...) All together, there are four spreads with activities on each, plus the pull tab on the cover. The cardboard is extremely heavy-duty and will stand up to multiple manipulations by small stickers. Pieces are sturdy pull tabs, wheels, and moving cardboard with no flaps or sticking out pieces to pull off. Verdict: Although the art and text is not particularly memorable, babies and toddlers will enjoy developing their fine motor skills by manipulating the pieces. Librarians will appreciate the sturdy design. I really need to save these somewhere other than Facebook, because they are hilarious. I am reading John Himmelman's Chickens to the rescue to the four year olds at school. We all really REALLY enjoy pumping our fists and yelling "chickens toooo the RESCUUUUE!!!" But then I realize that most of them won't know what a watch is. So, when Farmer Greenstalk drops his watch down the well, I change it to "dropped his cellphone down the well." Then a small voice from the back pipes up "what's a well?" Let's Read and Find Out science books have been around for quite a long time. However, Harper has recently updated and added a new selection of titles. I've been looking for more titles on weather and didn't want the more bare-bones of actual easy readers, but something intermediate and these titles seemed like a good fit. Melissa Stewart has done several of the recent titles, including this one on Drought. Simple blocks of text explain the progression of drought, from a lack of rain to more severe consequences. Explanations of the water cycle, how climate change can affect droughts, and the long-term consequences are also included. The text and illustrations are interspersed with historical and scientific facts and science experiments. Back matter includes further experiments, ways to save water, a list of more books in the series, glossary, and a university website with further information. Ceolin's gentle art, with details of animals and plants, adds to the narrative aspect of the book. The people pictured, including scientists, show a diversity of race and gender. Verdict: This is a good example of how a simple book can be just the perfect fit for a hole in the collection. 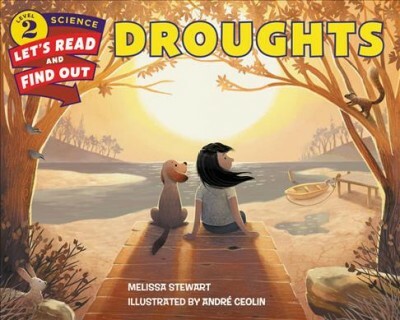 This and other titles in the series have been circulating regularly to kids interested in weather, parents helping their kids advance in reading comprehension, teachers doing weather units, and I've also pulled several of them for a nonfiction authors unit on Melissa Stewart and other authors. Recommended. When I'm looking for mysteries for middle grade readers I'm looking for just that - mysteries. The kids generally aren't interested in complex characters, literary writing, or heartfelt messages. They want a dang MYSTERY. Preferably with clues and, depending on the kid, an actual murder. These are some of my most-recommended series and authors. This was a very challenging week. - Monday I was still dealing with the fallout from last week's incidents (I'm going to be stressing over this for a long time, trying to decide if I handled things the best way or not, but at least I finished writing all the incident reports, letters, etc. ), plus a major collection development project, purchasing nonfiction. In general, I don't purchase prebound or from any vendors who cold call or email me. Most have learned to cross me off their lists before I move from "disinterest" to "active dislike." However, I have one nonfiction rep who covers ABDO, Bearport, Creative, and a couple other nonfiction companies. It's easier to order with her because she handles all the discounts and has a good knowledge of her stock and what is new (or coming soon) so I can tell her what subjects I need. - Tuesday was a very, very long day. I welcomed the District Battle of the Books (and distributed a LOT of flyers for the maker workshop on Friday), plus enjoyed seeing the kids using their breaks to race back and check out books instead of eating cookies! Then I had a desk shift, then Lego Club (although I admit that my teen aide mostly ran it. I stuck my head in once and there were about 50 people in there, which was totally unexpected! but she did a great job). I had an urgent project to finish - updating the staff schedule for April-May. About 5pm the EL families started showing up. They mixed with the Lego Club kids and it was Legos for all! Eventually the Lego Club kids left and then the EL teachers ordered pizza for the families and they and some high school volunteers helped them get signed up for summer school. We had probably at least 50 or more people there, which was awesome! I got a lot of kids interested in programs, which will mean their parents are more likely to come back. The high school volunteers were excited to hear about Anime Club too. I gotta say, teachers rock it much harder than I do! They're like "another 12 hour day, nbd" and I'm like "one 12 hour day, am on the verge of imminent collapse." - Wednesday my associate came to the rescue. She continued clearing up the destruction from the previous night (lots and lots of people, especially a lot who don't normally visit the library, means a big, awesome mess! ), set up and filmed the last Winter Wigglers, and handled the large number of people who came in. I came in to work around noon - I had hoped to just take the whole day off after all the extra hours I've put in, but all the time I had to put in on the various incidents meant I had work that wasn't completed. I sorted and processed some of the nonfiction orders, went through all the Battle of the Books titles, finished weeding a couple stacks of picture books that have been behind my desk, cleaned up paperwork, finished a new storytime kit: Pizza Play, and stacked up staff recommendations for my staff while I'm gone next week. - Thursday I got back to work on the nonfiction orders, various minor details, planning, outreach, emails, and other stuff. I set up some more remote collections with a charter school and went through a bunch of new books. I also made a Library on the Go visit. Finished the second storytime kit I'd been working on, Nursery Play. - Friday I attended the youth services meeting with my intern. We had to leave early as we had programs. I ran around frantically collecting stuff for the maker workshop, which was a huge hit. People were reluctant to leave when we closed at 6, but eventually they did and we set up a little for tomorrow. Also I discovered that I had no brown paper lunch bags. - Saturday so I went and got some before work, but it turned out I didn't need them - we only had 30 people. Our spring break coincides with Easter and it's really early this year plus a bunch of places decided to have their egg hunts today. After this week I was very happy with 30 people. I finished a bunch of last minute things and left! Long ago, I reviewed two of the Lulu books for Cybils, but never read the first book. In 2015 I was selecting titles for my new book club and was looking for books that would meet the kids' interests as well as feature more diverse characters and this popped into my head immediately. In Lulu's first story, we learn that she is known all around town for her love of animals. But her animals get her into trouble because her teacher most definitely does not like animals. When Lulu tries to show her how amazing animals are, she almost loses her class their treasured guinea pig! Now her cousin and best friend AND the whole class is mad at her! But there's no time to think about that, because the class is going on their weekly walk through the park and there are ducks to see...but then tragedy strikes. Lulu manages to rescue an egg, but what will happen when it's not an egg anymore? Will her teacher really take their guinea pig away if she discovers it? Lamont's sweet black and white illustrations show Lulu and her cousin Mellie and their class, noisy, exuberant, and interested in everything around them. There are plenty of cute, fuzzy animals pictured as well. The text is a step up from a very beginning chapter, but still comes in just over 100 pages and at a level a strong 2nd grader or average 3rd grader could easily read. Lulu isn't quite as idealistic in this first book as she is in the later ones I read; she gets into trouble and has little spats with her cousin. Overall though, this is a feel-good book for any reader who will enjoy Lulu's love of animals and the funny trouble she gets into. Verdict: This series has been quite popular and I'm sure my book club members who like animal stories will enjoy this, if they haven't already read it. Highly recommended. Revisited: I still love to recommend these; they haven't been quite as popular with my book club readers as I'd hoped - they are a little too challenging for our lower level readers. Claire and her older sister Sophie are having an adventure - of sorts. After all the recent fears and worries about Sophie's health, Claire has felt that she and her sister have pulled apart and their relationship is strained. When they visit their deceased great-aunt's house for their parents to pack up and dispose of all the antiques, the two sisters discover a mysterious unicorn statue and a fireplace. Encouraged by adventurous Sophie, the sisters climb up the chimney... and find themselves in a terrifying world with a monster chasing them. They manage to escape and Sophie decides the adventure never happened and tells Claire to forget all about it. Claire has always followed Sophie's lead and tries to forget, but when Sophie disappears, Claire takes up all her courage and ventures to the magical world again, only to discover that Sophie has vanished there also - and has been visiting the other world for months, making friends and discoveries without her. It's a beautiful, magical world, but also a frightening one. Claire is plunged into a confusing adventure, always one step behind the missing Sophie, and struggling to find out how things work on her own. During her journey, Claire discovers strengths she never knew she had even as she struggles to figure out who is friend and who is enemy. She witnesses the terrible cost of war and prejudice, and sees the aftermath in the lives of her new friends as well as how she and her sister are both affected as well. While the story employs many wish-fulfillment tropes, like discovering magic and royal blood, it offers them in a fresh setting with strong, multi-faceted female characters that keep the story interesting and exciting. Verdict: A strong debut fantasy for middle grade readers, hand this one to fans of E. D. Baker, Merrie Haskell, and Diane Zahler. Patricelli adds another delightful title to her board book series of silly baby experiences. Patricelli's rosy-cheeked, white baby has a hair. Just one hair on their head! They take good care of their curly hair, decorating it, washing it, and brushing it. And it grows! Soon it's time for Baby's first haircut. It's a little scary, but it ends well - and there's a final spread of all different kinds of hair, from poodles to bald heads, mohawks to unibrows. Patricelli's bold colors and lines show the cheerful baby and all its hair adventures, set against boldly colored backgrounds. The book is a sturdy square, with rounded corners. Patricelli's thick brushtrokes show marks below the layer of color, so don't think the book is dirty, it just looks like that. This is a popular series in my library, featuring the same round-faced baby who happily explores all the excitement and little adventures of learning about the world, from going potty to the first time to first haircuts. Verdict: If you haven't already been purchasing this series, now is a good time to start and don't miss this latest addition! Manushkin is a prolific author and this latest picture book is a nice addition to her repertoire, along with the delightful illustrations by a new-to-me artist. Amanda and Miranda are panda sisters and they both, along with their mother, love bamboo! In cheerful rhyme the pandas eat their bamboo, take a look at what their fellow zoo-members eat, and have the normal sibling squabbles and disagreements. Fortunately, at the end of the day, the two make up any arguments and are two best friends - and sisters - again. And there’s plenty of bamboo to eat! Hernandez’s illustrations are colorful and eye-catching, with fuzzy black and white markings for the pandas, bright purple leaves on blue trees, vibrant green bamboo, colorful birds, and lots of swathes of yellow, blue, green, and and purple backgrounds. I’m constantly searching for new books that are suitable for toddlers but with recent trends in picture books leaning towards older listeners, this can be challenging. This book meets the bill; it has bouncy rhythms, the text isn’t too long, cute animals and vibrant illustrations, and a simple storyline that toddlers can follow. Verdict: This might not be an award-winning title, but it’s what I need on my shelves and for my storytime providers and I’d guess that other librarians are also searching for these titles. A great addition to toddler storytime. 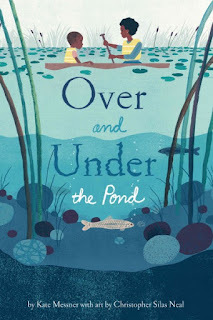 I've never really thought of Christelow as a nonfiction author, but her picture book expertise translates well to this narrative nonfiction title. The first spread introduces a pair of teenage robins who are here to tell us their story. The story is told through panels of art, dialogue between the two immature robins (complete with speech bubbles), and paragraphs of text. It begins with the male robin's migration north, glosses lightly over mating, and jumps into nest-building and eggs. The robins' choice of a nesting spot on top of a hoe is taken from Christelow's own experience (explained later in the back matter). The robins guard and protect their eggs, although one is lost to a hungry squirrel, and later care for their hatchlings. The baby birds grow from hideous, featherless creatures (I am not one of those who likes baby birds. Ugh.) to fledglings ready to fly. Along the way, one of the three falls prey to a hungry hawk. The two remaining birds, teh ones telling the story, continue to explain their growth and development, learning to live with the flock, and beginning to care for themselves as their parents prepare to raise another family. The story ends as the robins migrate south with their flock for the first time. Christelow writes an author's note about her experience with robins and encourages readers to observe their own backyards for wildlife and seasonal changes. 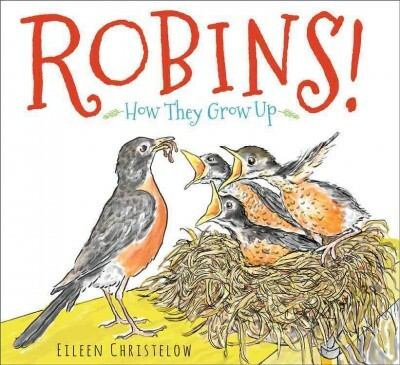 The book also includes a glossary, more facts about robins, and a short list of sources. It can sometimes be hard to find solid titles on "ordinary" animals. For my audience in Wisconsin, robins are a common bird that many kids are likely to see about in the spring and summer. This book is an excellent resource for encouraging kids to explore their local wildlife, learn simple facts about bird life cycles, and hone their observation skills. Although the text can be lengthy in parts, the illustration panels tell their own story that younger children can easily follow while older readers and classes will find much to explore. Verdict: An excellent resource, not to be missed. Recommended. This was an exhausting and frustrating week. I did not get much done because of all the incidents and other things going on. Next week will be even busier. Then I can have a break. I need it. Princess Serena is bored in princess school - and she hates her name! Call her Princess Pulverizer, because she's going to be a knight! Her father objects, but Pulverizer knows just how to get her way... at least she thinks she does! This story starts out as a typical anti-princess tale, with wild Pulverizer wreaking havoc and demanding to be a knight. Things start to shift a little when her father, the king, points out that being a knight isn't all fun and games either. If Princess Pulverizer wants to be a knight, she's going to have to learn just as much as she would if she was going to be a proper lady. She'll also have to learn to be a nicer person, less selfish, demanding, and greedy. In fact, before she can even start learning to be a knight she must do eight Good Deeds! Doing good deeds isn't as easy as it seems, and Pulverizer is soon in trouble. But with the help of an always-scared knight-in-training, his pet dragon (he's really gassy but he makes great grilled cheese) and Pulverizer's own determination, she just might manage to get started on her good deeds. Balistrieri's cheerful cartoons show a red-headed wild child with plenty of pep and vim, but also a fair helping of ego. Pulverizer smashes her way through life, landing in puddings, getting trapped by stinky giants, and attacking dragons with little thought for the mayhem that surrounds her. Asides from a couple villagers in the background, all the characters are white. There's lots of gruesome and icky detail, with warty giants, disgusting slop, and plenty of farting and belching jokes. Verdict: This is a little different from the average "tomboy princess wants to be a knight" beginning chapter. It's clear that Pulverizer doesn't think about anyone but herself, even if she's starting to learn that she might need friends by the end of the book. It's funny, but much more gross than Princess in Black. Hand this one to fans of Dragonslayers Academy or Time Warp Trio. I was a little skeptical of this mystery, despite Ms. Yingling's recommendation. The cover just didn't really grab me and I wasn't sure we needed another art heist book. But it turns out, we do need this one! It's not only a great middle grade read, it's just a great read in general and I enjoyed it myself. The book starts abruptly with middle schooler Florian's abduction of Romanian gangsters. Fade to black and the real story begins... Florian has moved (again). His parents, both involved in art and security, move frequently. Florian has developed T.O.A.S.T. to pass the time and amuse himself more than anything else. The Theory Of All Small Things has helped Florian figure out an art heist in the past and, to his surprise, garners him a new friend in the form of soccer-playing, African-American Margaret. The two are surprised (and somewhat thrilled) to get swept up in an art heist, as well as the search for Margaret's unknown birth parents. Along the way we find out why Florian has been kidnapped, solve several individual mysteries, go along on some exciting adventures, especially when Florian gets picked to be a consultant to the FBI, and even see Florian starting to enjoy typical school-kid life, for the first time. The mystery is really well done, with lots of clues and twists, but not so many that you spend half the book trying to break codes (not a pastime I personally enjoy). There are unresolved issues left (what will Florian tell Margaret about her parents?) that leave room for a sequel. Florian isn't stuck-up or obnoxious; he makes mistakes, uses his theory incorrectly, does stupid stuff and gets in trouble, but also respects Margaret's intelligence and skills and treats her as a full partner. Verdict: This is a great mystery series I can't wait to introduce to my middle grade readers. It's definitely going on the list for our mystery month for book club! This British collection of nursery rhymes has cute illustrations, but doesn't quite make the grade. The nursery rhymes included are a mixed bag, from "Old MacDonald had a farm", "Five little monkeys", and "Mary, Mary, Quite Contrary" to rhymes that aren't well-known in the states or have fallen out of use, like "Three blind mice", "Goosey Goosey Gander", and "See-Saw, Margery Daw". There are slight change to some, but not all, of the rhymes. Only the first verse of "Mary had a little lamb" is included, and in "Goosey Goosey Gander" the narrator leads the old man down the stairs, instead of throwing him. But the blind mice still get their tails cut off, the baby falls from its cradle, and the old man in "It's raining, it's pouring" bumps his head. Delahaye is a print and clothing designer, and it certainly shows in the gentle pastels used throughout the book. Smiling animals, some anthropomorphic, some not, adorn the pages in soft blues, greens, browns, and grays. The farmer's wife, a grey kitten, appears to have dropped a plastic knife and given up on the idea of cutting off the blind mice's tails, and most of the rhymes show the animals playing together, rather than actually illustrated the actions described. The book is a tall rectangle, about 9x6 inches. Like most of Tiger Tales' board books it's heavy on the cute illustrations, but light on the sturdy binding. The pages have a good, thick, cardboard feel but the binding doesn't feel like it will stand up to multiple uses. Verdict: If you are looking to add more nursery rhyme board books this is an acceptable purchase, but it doesn't particularly stand out from the crowd. A fuzzy mouse and chipmunk are best friends. Until an interloper comes along. A nut! After a little negotiating, Chipmunk takes the Nut and soon they are best friends. But…. after all…. Mouse really, really wants that nut. So she comes up with a clever plan to take the Nut. Now Mouse and Nut do everything together and are best friends. But then a mysterious figure shows up to take the Nut…. Chipmunk and Mouse squabble over the Nut until a third player shows up on the scene - a squirrel! And Squirrel has something to say…. It’s actually HER nut! After some quiet reflection Chipmunk and Mouse apologize and are best friends again… along with their new friend, Log! Valentine’s earth-hued illustrations show a fuzzy mouse and chipmunk that are more alike than they are different, even if they may not realize it. Nut is truly magnificent, a shiny acorn with a firmly attached cap. Listeners will giggle along with the characters’ antics as they get caught up in the excitement of a new (and shiny) friend. Verdict: A great read-aloud, this story is sure to make your storytime listeners giggle and maybe even think twice about sharing a new toy (or friend). A fun addition to your storytime repertoire. I was super excited when I saw Beccia was doing another wacky foray into history and this book fully met and exceeded my expectations. Also, my colleagues will think twice about asking me what I’m reading during lunch in the future. Mwa ha ha ha. Beccia focuses on seventeen stories of famous remains, how they came to be saved, and where they are now. Between these sections, she includes lots of ghoulish science and history about vampires, zombies, organ transplants, clones, and more. The main stories range from the legendary (Ines de Castro) to the conspiratorial (John Wilkes Booth) as well as the scientific (Thomas Alva Edison). Readers will learn about how bodies decompose, exactly how many medieval medicines contained human body parts, and the perambulations and final fates and many famous heads, skulls, legs, fingers, hearts, and more! Want to know the scientific truth behind vampires? The real story of George Washington’s teeth? Whether it’s really possible to clone Elvis from his wart? You’ll find all the answers here. Told with humor and plenty of ghoulish delight in the stories of rotten flesh and wandering body parts, this is sure to appeal to kids who love weird history and gross-out factors. Humorous footnotes add to the experience. There is a bibliography, source notes, and index (to be included). Verdict: I finally have a book for that 5th grade girl who wanted to research cryogenics. Also, this was an awesome read and my colleagues are going to be giving me weird looks for a long time. I love Carlyn Beccia! You MUST have this one in your collection, especially if you serve 5th-6th graders. Really, absolute must. RA RA Read: I survived...reading all the books! I first heard about I Survived from the kids years ago when it was added to our school's Battle of the Books list. It's grown in popularity until it's now nearly as popular as Wimpy Kid and other perennial favorites, at least in my library. Thanks to some suggestions from Storytime Underground and my own mental files, I've compiled a list of titles to suggest when kids survive their initial bout of reading and clamor for more. New I Survived books are published approximately every six months. Fans will also want to check out the accompanying I Survived: True Stories series, the true stories behind the stories, if you know what I mean. I shelve these with the fictional stories. Top Secret Files series by Stephanie Bearce from Prufrock Press is a higher reading level, but will definitely attract kids who like the historical and short story aspect. Each book contains short anecdotes, historical facts, and other information. There are titles ranging from wars to the wild west and gangsters of the 1920s. Nathan Hale's Hazardous Tales are awesome. That being said, you will have to do some booktalking as they're a different format than I Survived. They are graphic novels with dense text and illustrations, highlighting different historical moments. The series starts with One Dead Spy, but my personal favorite is Big Bad Ironclad. There are also more contemporary stories, like Treaties, Trenches, Blood and Mud, a powerful, but grim retelling of World War I. Get kids hooked, and they'll be fans, but they'll need to be fairly strong readers. Capstone has a great series that are not only good read-alikes for kids who are into Choose Your Own Adventures-style books, but also will grab the I Survived fan crowd. Can You Survive....? 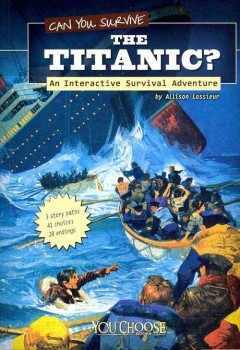 takes different historical events (like the Titanic) and general disasters (like being lost in the jungle or shipwrecked) and walks kids through choices to see if they can survive. They include nonfiction information as well. There are also numerous history-related titles and series in the You Choose... collections from Capstone. A new series that has kids pretty excited is Lost! by Todd Olson. So far there is a title on Apollo 13 and one on World War II with more to come. These are an excellent read-alike for I survived, with blow-by-blow descriptions of the action and I was really impressed with the first title's inclusion of multiple perspectives, including the teen daughter of one of the astronauts. 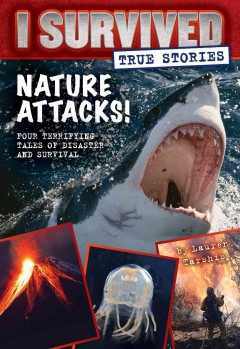 For straight-up survival, a new series from Terry Lynn Johnson, Survivor Diaries is awesome. I reviewed the first title, Overboard!, and it flies off the shelf. The mix of real-life settings and survival tips, plus the easier reading level and diverse characters are what will make this series a standby for the genre, in my opinion. Back to the straight-up adventures with historical aspects, Gordon Korman has several adventure series. There's one about the Titanic, Island, etc. What I love about these is that they're split into 3-4 volumes so kids don't feel intimidated by a huge book or by a lengthy series. Korman is a great writer and kids love his fast-paced adventures. Race the Wild by Kristin Earhart. I have a printable bookmark with annotated selections from this list available. This week at the library; or, and NOW it snows? Monday - I forgot my dentist appointment, rescheduled, was late to work, realized after I got there my shirt had stains on it. Then the internet and the whole system went down for all libraries from mid-morning until 2:30pm. Then we suddenly had a snow storm and the roads were awful - took me almost an hour to get the ten miles home. Fun times. Tuesday - I overslept (probably due to all the stress from yesterday), then sent a lot of orders (sorry to the Ls in Tech Services, but I needed retail therapy), very productive board meeting - I'm going to take Library on the Go out to OPtions (local charter/home school group affiliated with the public school), then a small group at Messy Art Club but they were very enthusiastic and had a great time. Wednesday. Three outreach visits, my associate did We're going on a bear hunt yoga, working my way through a to-do list. I've lined up several new outreach venues and made phone calls. Blech. To the phone calls I mean. Thursday. Ugh. I think too many kids have hugged me. I have the crud. The construction has begun and rerouted all the traffic in front of my apartment building. Yay. I arrived at work with a miserable headache, started cleaning off my desk and trying to catch up on various things. 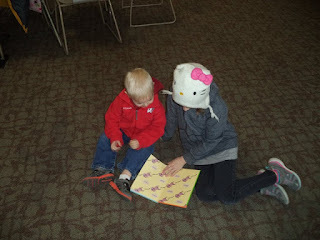 I started Library on the Go outreach at OPtions, one of the things I set up at the board meeting earlier this week, then directly out the other end of town for outreach storytime, then across town for another outreach program. I never did figure out a way to make the schedule take into account that sometimes I need 10-15 minutes to get across town for the different schools! Fortunately, the teachers are very flexible. Full, enthusiastic, and noisy book club. I threatened to breathe on them if they did not calm down. Everyone loved 26 Story Treehouse by Andy Griffiths, one person loved and one person hated Christian Slade's Korgi, and I am still working on getting my two reluctant readers to pick up books. Once they start reading them they're fine, but they are currently banned from comics and very grouchy about it. I left 15 minutes early, to go to Walmart and buy vast quantities of marshmallows for next week's program. Friday. Emails, to do lists, cleaning off desk. Worked at the ys desk while my associate/intern did anime club (20 kids!). Various emergencies, including one toilet plunging, then I got set up to go out to 4K swim. I left late, having been asked a gazillion last-minute questions! However, there was a smaller group than usual and not much happening until around 7:30. Basically 4K families get to go and swim at the high school pool (which is, apparently, unheated). I only checked about about 20 books. My school colleague said they usually get around 100 people, but I think it was a LOT less than that - I think everyone was at one of the other schools' art night. Anyways, the main reason I went was to meet with my school colleague and the other 4K center directors to plan the big upcoming party in April and we not only got that done, we also ironed out a bunch of other details. Then I hauled everything back to the library (got in and out without meeting - and freaking out - the cleaning guy) and thence home. And the week is, at last, done! Stinkbomb and his little sister, Ketchup-Face, are in for a prime kerfuffle in this extremely British (and even more extremely silly) new series. In their first kerfuffle, Stinkbomb and Ketchup-Face discover a Horrible Crime: Stinkbomb's twenty-dollar bill has been stolen! They visit King Toothbrush Weasel to find out what's going on and discover that Evil and Wicked badgers are responsible for, well, everything. So they take off on an adventure to stop the evil badgers. Along the way they'll meet a shopping cart, Stinkbomb will sing her new song many, many times, and they will have to deal with the Army of Great Kerfuffle, Malcolm the Cat. In their second kerfuffle, the two siblings discover that the Bad Badgers have escaped from jail! With the wise guidance of Miss Butterworth, ninja librarian, they go on a quest to find the Magic Porcupine. Along they way they meet some suspicious racoons, Ketchup-Face makes up a new song, and they take a very long (and boring) bus ride. There is also a mysterious rain of black goo, smelling of bananas. Which leads to the question, do hammerhead sharks eat bananas? The books are illustrated with a plethora of black and white cartoons by the illustrator, Sam Ricks, showing a horde of pointy-nosed badgers, two gangly siblings, the vaguely confused King Toothbrush Weasel, and all the many strange and quirky inhabitants of Great Kerfuffle. This is extremely silly. It's a genre that really only crops up in British books, or so I've mostly seen. If you like silly, it's very funny; Stinkbomb and Ketchup-Face's parents are never present because they prefer to go away when the children are having a book. The ninja librarian is the only one who can handle the future of the story. Malcom the Cat's idiosyncracies will make anyone who's ever met a temperamental kitty giggle. There's also plenty of gross humor, a la Captain Underpants. 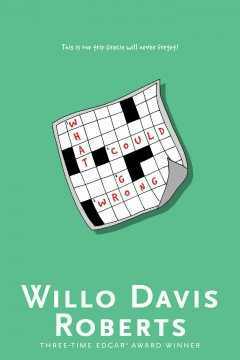 Verdict: If you have early chapter readers who enjoy this type of silliness, this is sure to be a popular choice. It's the kind of off-the-wall series that is sure to find a quick, if brief, following. 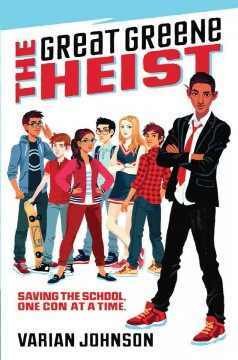 Readers who like silly and sometimes elaborate language, who want a short, fun read, and who can handle a book so far below the Pilkey line that it's basically stealing Captain Underpants' underwear and running away with it, proclaiming how Extremely Naughty and Badgerish it is being, will enjoy this ridiculous romp. Barely have I finished giving up on reading and reviewing all the fantasy picks for my second Book Explosion meeting, when it's time to tackle adventure! Nonfiction I've got covered, no problem. But the fiction... I started with this new title which I've seen promoted in several places. Sebastian lives a life of order, math, and logic. He does precisely the right thing at the right time all the time. Until one day he has an argument with his not-so-logical cousin and finds something unexpected - a pig in a tiny hat. Sebastian's orderly life is disrupted as he's drawn into the weird and unpredictable Explorers Society. Meanwhile, a lonely girl named Evie is going out for her weekly dinner with the boring Andersons. It's the only time she gets out of the orphans home she lives in, but she's not sure it's any better. Until their boring dinner is interrupted by two terrifying men, one with half his face melted off, the other with horrible wires poking through his jaw. The next thing she knows, Evie is fleeing for her life through a secret tunnel, the Anderson's house is on fire, and her only hope is to contact the Explorers Society and find her missing grandfather, the last family she has. Once they meet up, the two are off on a wild adventure to find the companions of Evie's grandfather and solve the mystery of his disappearance and last letter. Along the way they will get shot at, climb towers, encounter many animals with hats, and break all the rules. The tone of this book is definitely in the flavor of Lemony Snicket. There are frequent asides from the narrator, rather rambling digressions into the meaning of words and encounters, and lots of tongue-in-cheek descriptions. There's also rather an overkill of quirkiness, from Sebastian's job of disorganizing things to long, prattling conversations with no meaning, to the adorning of small animals with hats. This is in rather odd juxtaposition to the very real danger the children face, including men with guns, and the tragic backstory of Evie's grandfather's disappearance, involving the entire destruction of an island. Of course, both Sebastian and Evie are white, as almost all the other characters appear to be. The vocabulary is often advanced and, while Sebastian is supposed to be a genius at math and science only his photographic memory is really called upon. Evie has no especial talents, other than her desperate wish to once again have a family and a place to belong and her recklessness. Verdict: Fans of Lemony Snicket will devour this, moan in anguish over the abrupt cliffhanger at the end, and wait desperately for another installment. However, it offers little new in the way of middle grade adventure and fantasy, neither in plot nor in characters. An additional purchase where Lemony Snicket is popular. Does it make my intelligence suspect that it took me several minutes to figure out how the color wheel on this worked? Each page has a cute little rhyme and features a cheerful array of color-themed animals and flowers. For example, the blue page says "Hurry, cricket,/Join the romp,/Spring brings BLUE - /hope and stomp." The page features some simple blue flowers, a blue cricket, green leaves, a red ladybug, yellow bee, green grasshopper, and orange caterpillar. As the pages progress, they add a bug. So the first page is red with a red ladybug, then orange with an orange caterpillar and the ladybug, all the way up to the final spread with a sixth bug, a purple butterfly. At the side of the book are two ridged wheels. As you turn them, the colors (a die cut circle in the center of the flowers) change. When the colors are correctly aligned, they match the flower. So, for the orange flower, one wheel is yellow and one red. There are also little dots on the wheels to line up so they completely cover the circle. With just six spreads, the book is small and compact, the last page being made in several layers to accomodate the wheels. The wheels themselves are very thin, almost cardstock rather than cardboard, but since they're very protected by the book I think they're probably fine. The only drawback is they're difficult to turn separately, since they're so thin and right on top of each other. Verdict: A fun way to introduce beginning color blending. Recommended. The story begins in a city where the the Pickwicks, a family of fluffy little cats (or possibly dogs? I’m not sure), load up their Pickwick pickup for a trip to the beach. They’re alone on the road, heading for a box-girder bridge, when other traffic starts showing up and the counting begins. Squeaky jeeps, scooters, motorcycles, and hydraulic haulers proliferate until there’s a veritable traffic jam and they all discover - the bridge is closed! Now there’s really a traffic jam! Everyone is just sitting in the heat and feeling grumpier and grumpier until Pip and Peach, the Pickwick pups (or kittens) come up with a solution - a picnic right there on the bridge. Soon it’s a street party with everyone joining in to enjoy the party. When the bridge finally reopens, the Pickwicks get their picnic on the beach, just a little later than planned. Kurilla’s art is cute and friendly, with lots of colors, zipping vehicles, and leafy green trees. The author is from Chicago and the illustrator from Boston and I could see echoes of both cities in the illustrations, which show little bays, lighthouses, and bridges as well as brownstones, flashing billboards, and all the parts of a busy city. Verdict: While not particularly unique, this is the type of story that will be a great standby for storytime, a fun read for summer, and an excellent addition to your counting books. A strong addition to any picture book collection. Another gorgeous nature picture book from Kate Messner and Christopher Silas Neal. A dark-skinned mother and child float on a pond in a small boat. They look down from above and see turtles, fish, and other creatures from below. Birds fly over the pond, larva build homes under it. Moose eat above the pond, beavers dive deep into the pond. As the day turns to night, the light fades and different creatures come out to float above - and below - the pond. An author's note addresses the ecosystem of the pond. There is also a picture glossary that adds information about each of the animals pictured. A few resources are included for further reading. 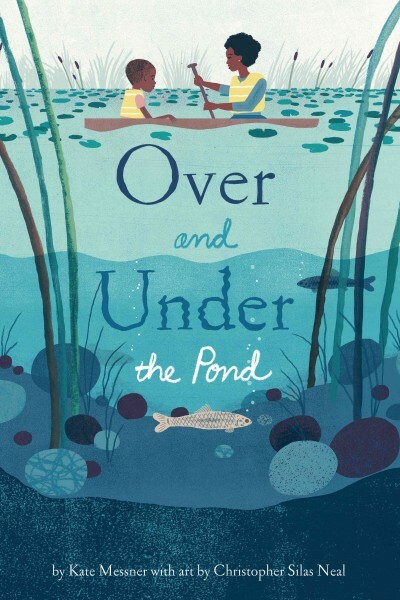 This book has the most dazzling perspectives, showing what the humans' boat might look like from below, the contrast between a turtle swimming through the water and a turtle sunning on a log, the slow changes as the daylight fades to evening and night. 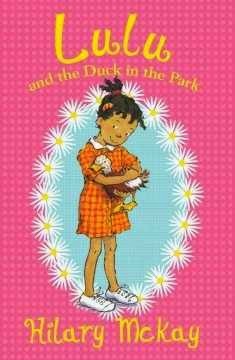 I especially appreciated seeing more diversity in books about nature - too often children with darker skin are shown only in urban settings. I've also successfully used this series with children who are struggling with the concepts of "above" and "below". Verdict: A worthy addition to the series, strongly recommended for use in storytime and nature programs or just for encouraging children and families to explore their world. Love them or hate them, Diary of a Wimpy Kid is still going strong. Interest died down for a while, but several years ago I had to haul all our extra copies out of storage because of a sudden, inexplicable demand and they just keep going. I am, personally, not a fan - as I tell kids, if Greg came into my library I'd probably kick him out. Now Big Nate is different - he's a good kid at heart and I'd give him another chance. Anyways. Includes both comic strip collections and notebook novels. 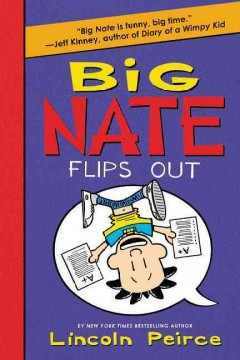 Parents who dislike the attitudes in Wimpy Kid will usually prefer Big Nate. I worked a late shift on Wednesday, planning to do childcare for our Friends meeting. No kids came (which was just as well, b/c we forgot to book the room!) but I got a lot of work done in the quiet evening. On Thursday Tumtum, the more active and alpha of our two hamsters, chewed through the wire netting and took off. We barely caught Nutmeg as he followed his friend to freedom. After about 8 hours of intensive activity (including multiple children searching the library repeatedly), he was discovered by a staff member making a break for the lobby and ultimate freedom (and death) and recaptured. Tumtum and Nutmeg are now sulking in "prison", i.e. 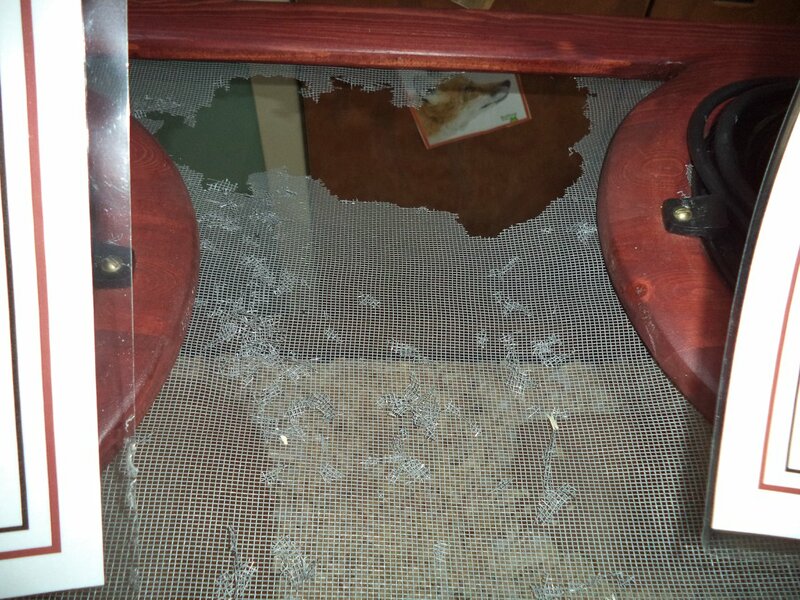 their old cage, until the new lid comes for their aquarium. 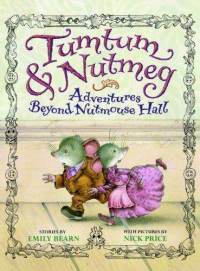 In the first story, two little mice named Tumtum and Nutmeg become helpful fairies for two neglected children. With the help of General Marchmouse, they defeat a Dahlesqe and horrific mouse-hater, Aunt Ivy. In the second story, General Marchmouse ignores their wise warnings and is captured and taken to the school, where he is imprisoned with wild gerbils. But Nutmeg - and a group of pogo-ing ballerina mice - save the day. In the third story, the General's impulsive adventuring once again lands him in trouble, when he and Tumtum and Nutmeg are captured by rat pirates. But with the help of the two children, who believe Nutmeg to be a good fairy, they manage to escape. These little stories are a mixture of Borrowers and Redwall for the younger crowd. They tend a little towards the cute, an unavoidable trap when you're dealing with anthropomorphic mice, but will be quite enjoyable for younger children, especially those who may have enjoyed Jill Barklem's Brambly Hedge and aren't quite ready for Borrowers or Redwall. This collection was previously purchased at my library and, since the individual books weren't available I didn't see a lot of kids going for this thick volume. For a long time it sat on our shelf, with occasional interest but no real fans. However, this past year I have had several strong, younger readers who actually want longer books that have this level of gentle humor and mild adventure. Several homeschooling families have fallen in love with these and I purchased the rest of the collected volumes. We even named our library gerbils after them! Verdict: The length of the collected stories will discourage a lot of young readers and the separate volumes aren't available in the US. I wouldn't recommend this for every library, but if you have an audience that really loves this type of cozy mouse story they will be a strong purchase for your library. Avani isn't happy about being the new girl in town. She's even more disappointed in the Flower Scouts troop. Unlike her Pine Scouts troop at home they don't do anything fun, just talk about boys and makeup. But what Avani doesn't know is that, quite a ways away, another girl is having a hard time fitting into her scout troop...and only has a few minutes to pick up her specimen for her badge! Turns out, she picked Avani. At first she's shocked, but Avani figures out pretty fast that she'd much rather be a member of the Star Scouts, even if her troop has some.... issues... than the Flower Scouts back home. But it's not long before things start getting dangerous, with a rivalry with the methane-breathers and a challenge to Avani belonging in the Star Scouts. After all, Earth isn't a member of the Galactic Union! There's an easy sense of diversity throughout this graphic novel. Avani doesn't automatically team up with the only other non-white girl in her earth troop. Although it turns out they have some interests in common, she has to get past her dislike of anyone with different tastes and how easily she dismisses the other girls. The aliens themselves have a huge variety of tentacles, colors, and personalities but there's still prejudice against differences and some rough competition. Avani learns that there's still a lot she needs to know about teamwork and friendship before she can truly fit into the galactic universe. 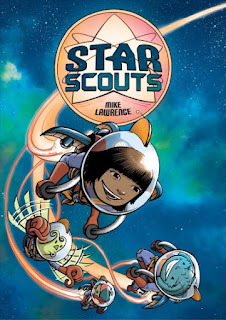 Lawrence has a crisp style that will attract fans of Telgemeier and Hatke along with a sense of humor that will appeal to Captain Underpants readers. This isn't quite the book for readers who want a more sophisticated story of interpersonal emotions - there's too many fart jokes - but it's just the right book for kids who like adventures and funny stories and are navigating the shift to upper grades in school, different rates of maturity, and changing interests among their friends. 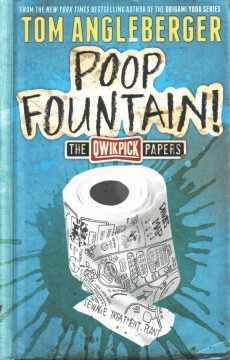 Verdict: A funny and exciting story, it might need a little booktalking to get it to the exact right audience, but once you've found them it's sure to be a hit! Also, accidental alien abduction is never not funny. Recommended.